A prescription blend of washed silica sand, an indigenous sandy soil and green compost. Screened to 10mm over a mesh screen, this material is widely used for soccer pitch renovation, tees construction and dressing along with use as a general landscaping soil. 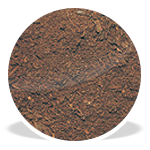 Made from a blend of green compost and our indigenous topsoil, the final blend is screened to 9mm over a piano wire. Superb for planting, turfing and general landscaping. Made from 100% certified green compost. This “soil” is screened to 10mm over a mesh desk.